Tina Karagulian is a artist, poet, and speaker whose work focuses on the intersections between spirituality and creative expression. In her memoir It Is Time, she shares stories of gender discrimination, the Armenian Genocide from her family history, awareness of the shadow within us all, and reconciliation through creativity, dialogue, and contemplative prayer. Her poetry and prayers have been published in Inner and Outer Space: Paintings and Poetry, Under the Papaya Tree: A Book of Love Poems, New Skin: Poetry and Prayers, and the following anthologies: Lifting Women's Voices, and Sustaining Abundant Life. Click here to buy It Is Time. 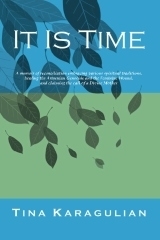 Click here to buy It Is Time, Kindle Edition. Black Rose Arts & Press has designed covers and assisted in publishing of the following books: Scarred Angels and Galilee by Paschal Murat Booker of Horsesdark Press, The Last Dance: A Daughter's Journey by Teresa Arata-Maiers, and Aganjú: The Òrìṣà So Hard To Find by Jo Anna Hunter of Black Madonna Enterprises. Love poetry takes many forms: addressing our Beloved as God or a loved one, or honoring the Spirit that is unseen by the naked eye, yet moves within nature and beyond the stars. This book of contemplative love poetry is meant to inspire us to find and rest in the pages of our heart. the heart.' She beautifully captures the boundless love that both invites and guides her into this ever deepening journey into the heart of love." "Tina Karagulian has crafted a lovely moment of repose and refresh in her latest volume: Under the Papaya Tree. The first half offers six psalms to our Beloved, each a prescription that soothes our soul's innermost longings. In the second half she moves seamlessly beyond our interior into the visible world, bringing the quiet, reflective voice that permeates and transforms our surroundings. This simple offering of a dozen poems will remain by my bedside, nudging me toward a restful night." "This collection of poems is the ripe fruit of a life passionately lived for the Beloved. Such profound wisdom and love are conveyed with such elegant simplicity and perfect choice of words. Every word is a rare gift from Tina's heart." "Awake in present love, this gentle poet frames for us an accessible understanding of the Divine. In her words, the everyday worlds becomes a psalm of praise." beautiful meditations of TINA KARAGULIAN we find ways to reconcile with the past, to forgive lost opportunities, and learn to deal with off-kilter attitudes toward that half of the population that is female. Tina’s poems are prayers." so that they may thrive on their intended roads. so that love’s true essence may revive and resurrect. within our bodies and minds. daily surrendering to Her wisdom. that feeds our deepest reserves. yet allow its sleekness to breathe us.